Hot off the heels of directing his first feature film (c'mon, we all know that on Sin City he basically just got to sit next to Robert Rodriguez while he was directing) The Spirit, it looks like graphic novel writer extraordinaire Frank Miller has his eye on another comic project to write and direct. No, it's not one of his own (how many does he have left that haven't already been spoken for?) 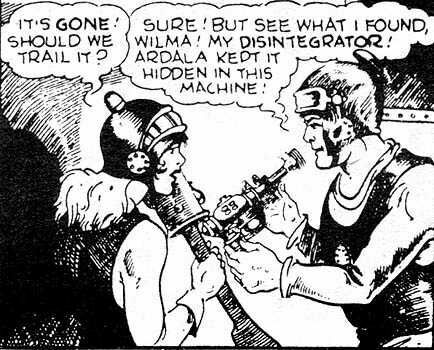 but rather an adaptation of the classic 1930's newspaper comic strip Buck Rogers. "Miller will write and direct his own big-screen take on the comic serial; while the creator has only begun to sketch ideas, it's expected to be a darker take, with many of Miller's signature visual elements and themes, such as corruption and redemption." Boy, I sure hope that "Miller's signature visual elements," doesn't mean he's just going to yet again use that stylized Sin City look. As far as I'm concerned it worked in Sin City (and therefore should obviously be kept consistent for those sequels) but after using it for The Spirit (which word around the net is it's horrible) I think he's employed it enough. It's not the only style you can do that looks cool, Frank - how about trying something different? "It's likely to be a priority project for Miller, though he has been mulling a Sin City sequel." "...the space explorer as someone who woke up in the 25th century to find Earth destroyed and was then consigned to roam distant planets." I've never been a follower of the original stories of Buck Rogers, but I've come across the comic strip from time to time and honestly I think it'd make for a good modern film. I'm still willing to give Miller the benefit of the doubt when it comes to future projects even if The Spirit does turn out to be as bad as people are saying it is (although this might ultimately change the studio's mind as to whether to even allow Miller get his hands on it). This is the guy who gave us the graphic novels Sin City and 300, so unless he makes error after error with his upcoming film projects I think we can give him a chance. However it's looking like skill on the printed page may not necessarily translate to movie making skill. Having said that, I'm going to go against the crowd and remain hopeful. I just know I'm going to be in the minority on this, but maybe he'll be man enough to take the criticism and learn from it instead of saying "you just don't UNDERSTAND my film!" So what do you think of Miller adapting Buck Rogers? Do you think it will make a good modern movie or should it be left well alone?